In the latest segment of Random Thoughts from the Humidor, I share my contemplations about Air Jordan, trends in cigar bands, and the impending change in weather. Chicago is about to host the 39th Ryder Cup, the biennial competition that pits the best golfers from the U.S. against the best from Europe. As fun as it would be to trade places with the likes of Tiger Woods, Bubba Watson, or Phil Mickelson, there’s no one I’d rather be this weekend than Michael Jordan. 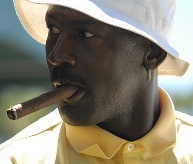 USA Captain Davis Love has tapped the “49-year-old, cigar-chomping, billionaire former basketball player” to “keep the players loose, to serve as possibly the greatest role model for success in sport, and to pass out cigars.” Sounds like a good time, and sounds like M.J. will have the best seats in the house at Medinah Country Club. I think it’s safe to say manufacturers have gotten increasingly creative with cigar bands in recent years. I understand this trend. After all, without a cigar band, distinguishing cigars from one another is nearly impossible. But how creative is too creative? Yesterday my colleague reviewed a cigar with a metal gear around the band. That’s a significant jump in originality from the days when raised type, glossy surfaces, or even double-bands were beyond the norm. And I’d say it’s even a far cry from the last band that made me do a double-take: the band of jaggedly cut Ecuadorian Connecticut wrapper leaf on Tatuaje’s “The Face.” It makes me wonder what’s next. A cigar with a band made of bacon? It’s almost October, and that means cold temperatures, icy winds, and low humidity is just around the corner. Over the years we’ve published a number of articles on this subject, and I thought I’d point out a few of them here for the benefit of preparation. First, you may consider finding yourself an indoor winter sanctuary for smoking, especially since smoke-friendly locales are hard to come by these days. Second, if you’re going to be smoking outside, you might want to consider stocking up on shorter smokes. Third, be sure to have the right beverages on hand, including winter beers and ingredients to make hot buttered rum or a Stonewall Jackson. Finally, we’ve also written tips on how to build a temperature-controlled humidor and altering your smoking routines to accommodate the cold. I'd really like to try a bacon wrapped cigar! I was just reading about cigar infused desserts – how food infused cigars!